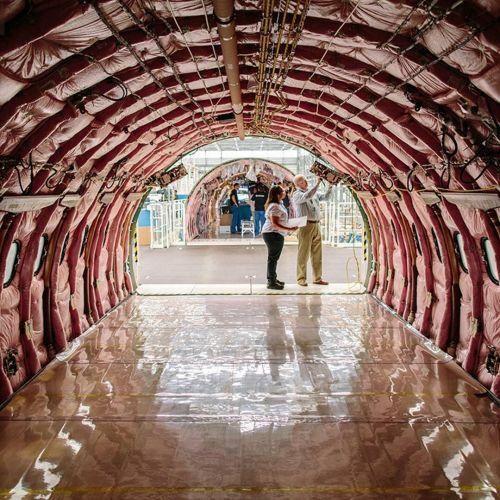 "Airbus employees inspected the first A321 jet assembled in Mobile, Alabama. Last week, @airbus formally opened a new assembly plant — the company's first civilian aircraft factory in the United States. The move offers the city that until the late 1960s owed much of its post-World War II growth to aviation a chance for revival. "I think Santa Claus has been here, and he's left us an airplane," Mobile's mayor, William S. Stimpson said. In all, the European company has received more than 18,000 applications for its plant in Mobile, many from retired military personnel with aerospace or manufacturing experience. The jobs could one day have a significant impact on the local economy. And for @airbus, the "Made in America" stamp could help weaken the home-field advantage of its rival, Boeing. @misterwidmer photographed the @airbus plant on #nytassignment." By nytimes on Instagram.